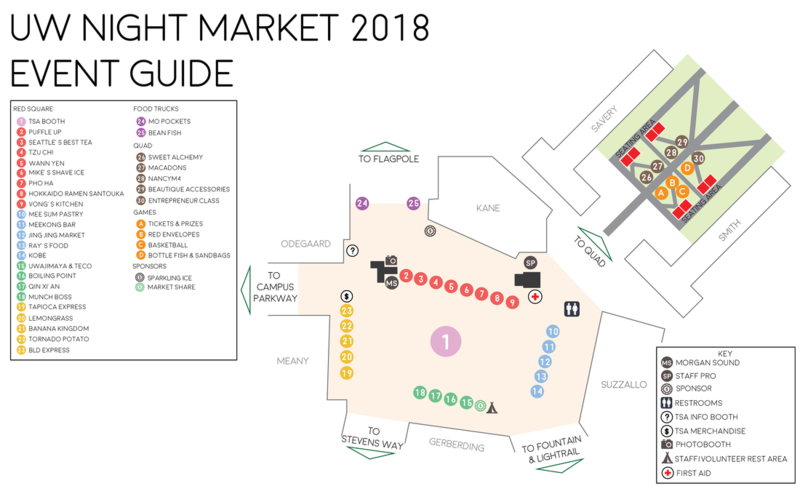 UW Night Market is FREE to attend, but please bring CASH for food & activities! The event is pet-friendly, but please have them leashed. ​This is a non-smoking and family-friendly event. Free parking available at E1, E12, E18, E19 parking lots (East campus). Limited paid parking available at the Central Plaza Parking Garage. Please see below for additional information on parking and transit. Questions? Come find us at the Info Booth​ (located next to Odegaard Undergraduate Library)! Wondering where your favorite vendors are, or hoping to snap some photos at our photobooths? ​Just take a quick look at our map to find everything you may need, and more!